Home>RS Earthquake solutions and map now online! The Raspberry Shake citizen scientist network has grown large enough and dense enough to properly locate earthquakes and assign magnitudes. Source. See stationView for a map of the stations. On January 23rd, the network reached 500 stations! Thats 0 to 500 in just one year! 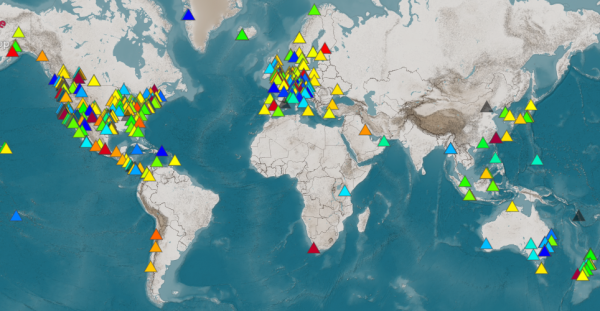 In light of the continued network growth and after months of tuning and testing by our partners at gempa GmbH, we are re-launching EQView– global earthquake solutions generated using the Raspberry Shake network. Solutions will now match those displayed in the EQInfo mobile app.